…the art of creative thinking! RBSM in Chicago for the month of December! 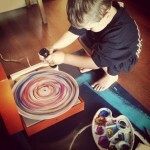 Mason, age 3 1/2, painting on a spinning record. Right-Brained Studio Mobile will be in Chicago during the month of December! Contact us to set up a customized art workshop at you home, school, alternative space or Kelly Pelka’s studio (located in Chicago). Photo: Mason age 3 1/2, painting on a spinning record.